Regular followers will be aware that for over 3 years now I have run a themed SAL on the first Saturday of each month. First we spent 26 months doing The Alphabet Club and then 12 months of the Zodiac. Now I have decided to listen to the People and post about your choice of theme. Each month I ask for suggestions on the blog and then make a poll in the IHSW Facebook Group from those suggestions. Here's a fun fact - in England we call them Speciality Stitches pronounced speci-ality but in America I have noticed your penchant for missing out letters and you call them Specialty Stitches and pronounce it special-tee. So now my European friends know if they speak English or American! But what are they? Basically anything which isn't a cross stitch. From a simple Symrna Stitch (an X with a vertical cross on top) to the Queen's Stitch and Jessica Stitches encompassing the dreaded French Knot! A lot of these stitches are commonly found in embroidery and have crossed over into counted cross stitch to add interest and texture to a piece. You can see the others on the Happy Dance blog here - Come Happy Dance With Me - Shepherd's Bush. Around about the same time I went on a stitching retreat where the class project was this Autumn Sampler. We stayed in a lovely converted barn rented by two sisters. One was a former owner of a needlework shop and the other was a chef. So the food was delicious. During the day we stitched this Jane Greenoff design called Woodland Walk (No 234C). 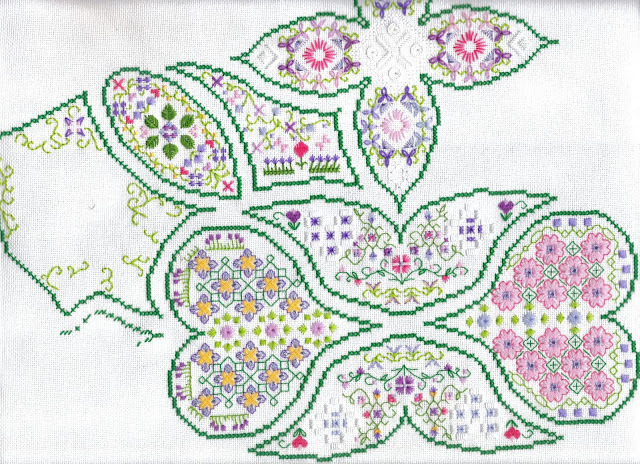 This is described as a piece for "the accomplished stitcher" as it involves a lot of speciality stitches as well as hardanger. There is also a gold acorn charm to attach at the top of the piece. I liked the sampler but have always felt it looked a little sparse and planned to add some extra motifs or bands. But let's be honest - after 20 years that is not going to happen! So I will just frame it as it as and get it on display. If you want to have a go at speciality stitches and feel a little daunted by them, why not try a small? This Drawn Thread freebie is only 3 x 2 inches but has 14 different stitches within it! Excuse the poor quality picture, it was a scan off my printer to capture the colours correctly. There are some beautiful versions in the Gallery on their wesbsite. One day this will be a finish! Now it's over to you. 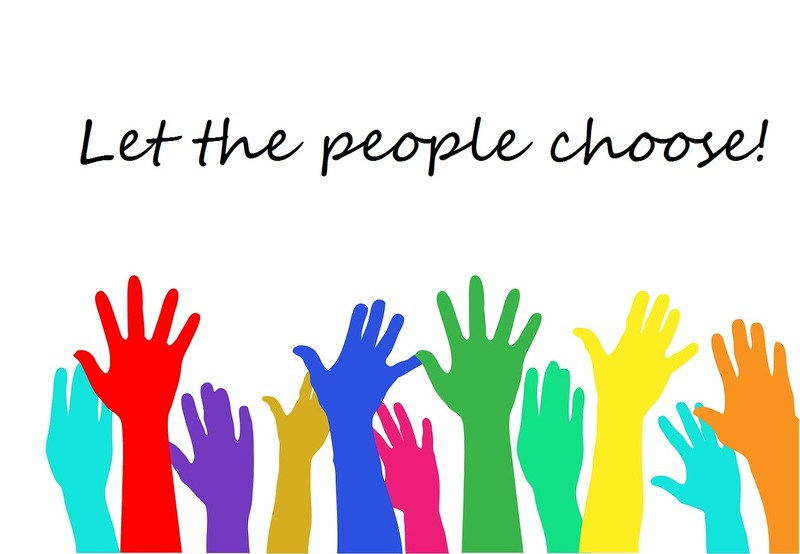 All you have to do is make a post on the theme of Speciality Stitches, mention The People's Choice SAL (you can copy the picture I used at the top of this post and in my side bar) and my blog. Please link up using the URL of the actual blog post, not the home page of your blog. I look forward to seeing what you all post. Finally, I need your suggestions for the next poll. Any thing, no matter how obscure, weird or random will go into the poll. Keep the theme suggestions to a single word or two - so you could have Cats, or Blue, or Holidays, or Warmth etc. Really anything which could be illustrated in cross stitch. Looking forward to reading them all! This is exactly what I expected your post to be like, clearly showing lots of tempting speciality stitches. Your finishes and WIPs are gorgeous and I wouldn't be surprised if quite a few All You Need Is Love designs appear in the not too distant future. Yes, I have every intention of stitching All You Need Is Love.... some day!! I have had that pattern printed off for years. Beautiful projects Jo but I like making just plain old x's. Great projects…. For awhile now I have not been doing cross stitch, just lost some interest. I think it would be great to do a sampling of different stitches. The Sheperd's Bush pieces are fabulous! You have done a lovely job with all the specialty stitches. I have not been successful with the queen stitch and we have no LNS where I might take a class. Yours look very good! Fantastic post. I have All you Need is Love printed. I hope to do it sometime. Your class project is beautiful but I agree with you. It needed more filled in. Guess the point was to learn the stitches and not so much have a complete finished piece. I remember the Around the World piece and I think I went to start it or might have started it. Then I realized it wasn't something I would enjoy the finished piece on display. I'm all linked up. Thanks for hosting! I'm really draw to the The Drawn Thread freebie ..lol. You should add Around in 80 stitches to your rotation.It will look beautiful when finished. Where's the specific post paying homage to the French Knot that everyone loves? siiigh I really love the colors in 80 Stitches; it's like the springiest spring stitch! Gosh, I speak American, who knew? You guys put too many letters and syllables. I have a few Elizabeth Designs charts that have speciality stitches in them. Around the world was such a great project, I didn't see many of them finished completely. Nice jobs, I also started the Around the World in 80 Stitches but still working on it. Hope you like what I present for this month posting. My cross stitch projects are mostly just that, cross stitches that is! Probably have a few speciality stitches sneaking in, but not many! I do embroider, of course, but that’s another story. I’ve saved All You Need is Love and I’d like to stitch it one day!!!! Ooooh! Finishing would be a good post. I wouldn’t be writing one ...... I seriously need to brave up and do some finishes! Tee hee! Being a Brit living in the US I just don't know how I say it....maybe it depends on who I'm talking to!!! Think I might head over for the Drawn Thread freebie...it's gorgeous! Thanks for sharing. This is some beautiful work, Jo! I agree the Papillon Creations piece deserves to be finished! You've made a gorgeous start on it! Lovely work on all of these! I don't need more WIPs, I don't need more WIPs. You've certainly be more courageous with your specialty stitching than me! I love the 80 stitches one and one day I WILL stitch that too!